Maximum Ink: Where did you guys come up with the badass idea for the game? 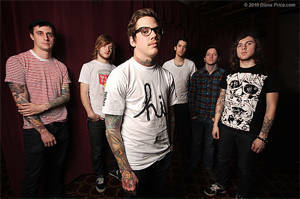 The Devil Wears Prada: The band wanted to do an extension of the Zombie EP. We wanted to give our fans something different than just a re-release. We met up with ECHO interaction group and developed the idea of Zombie Slay. It is a prequel first person swipe/shoot game to the Zombie EP Comic Book. TDWP: It was. Each level on zombie slay plays a different Zombie EP song. Slayin’ zombies and head banging at the same time. MI: How much say did the band have in the actual creation of the game itself? TDWP: Echo developed the game, and we shot ideas back and forth from there. We’d play the demos and shoot ideas back as to game features and mechanics. It was a really fun process! MI: What is the band’s fascination with zombies all about and where did it come from? TDWP: Mike was reading a zombie book at some point. I think it was World War Z, I can’t exactly remember. But he pretty much came up with the concept of a zombie concept record, and the rest just snowballed from there. MI: Obviously when it comes to anything zombie, the aesthetics and gore have a lot to do with it. Who did the art for the game? TDWP: Kevin Mellon did the art for the game. He also did the artwork for our entire Zombie EP Comic Book, so it just made sense. There are some rad zombies in the game. MI: What’s your favorite zombie movie of all time and why? TDWP: This may sound stupid because it’s not old school, but I loved Zombieland. It was hilarious. MI: Let’s say the zombie apocalypse was really happening: What would be your weapon of choice? Where would you go to hide? Who do you think the first to die in your band would be? TDWP: I think I’d go with an assault rifle with a bayonet on the end. You know, close combat and distance. I’d go to the mountains and find a cave with only one entrance. I feel like none of us would die, we’re professional zombie killers. MI: You guys are rumored to be taking a very elaborate stage show on the road this fall/winter. What can you tell us about it? TDWP: Yeah, definitely something we’ve never really done before. We’ll just say that if you come out to the show, you’ll be surprised. It’s going to be a rock show, for sure. TDWP: Australia is awesome. Every time we play there it’s amazing. I couldn’t be more excited to be on the DT North American tour as well, all the bands on the tour are great. MI: Tell me about “Dead Throne” in your own words and what you think of it now that it’s out and debuted at #10. TDWP: I am extremely excited that so many people went out and purchased the record. I definitely think its our best work and the fan response so far has been agreeable. MI: What can someone expect out of one of your live shows that’s never been? TDWP: You’ll walk out afterwards: sweaty, no voice, missing shoe, hopefully with a huge grin. The Devil Wears Prada brings their insane stage show to the Rave in Milwaukee November 3rd. Tickets are available at DeadThrone.com.